Hi there! 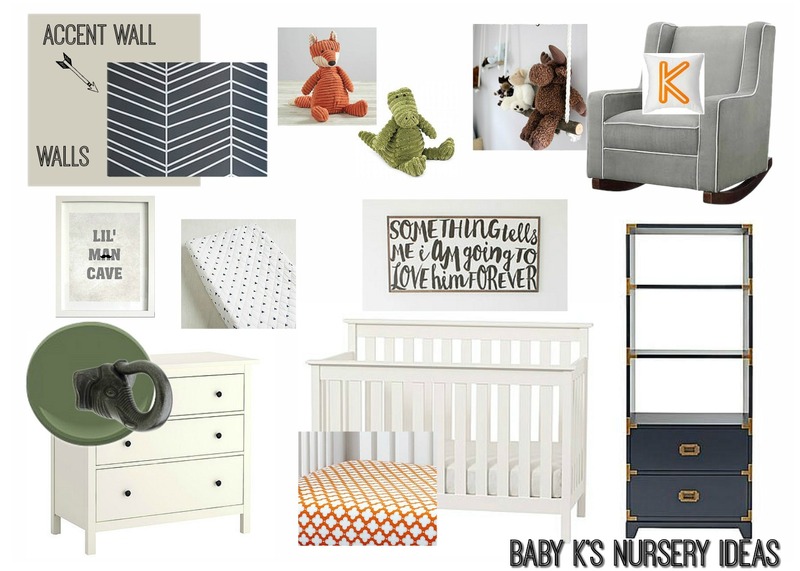 I finally got around to getting my ideas for Baby K's nursery out of my head and on to paper. 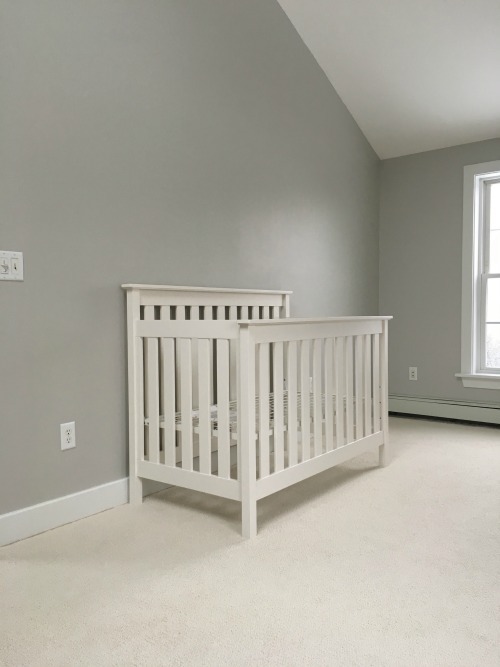 We've gotten a start on his room by painting the walls Sherwin William's Agreeable Gray and replacing the carpet with LifeProof Lower Treasure in Dove Tail from Home Depot. 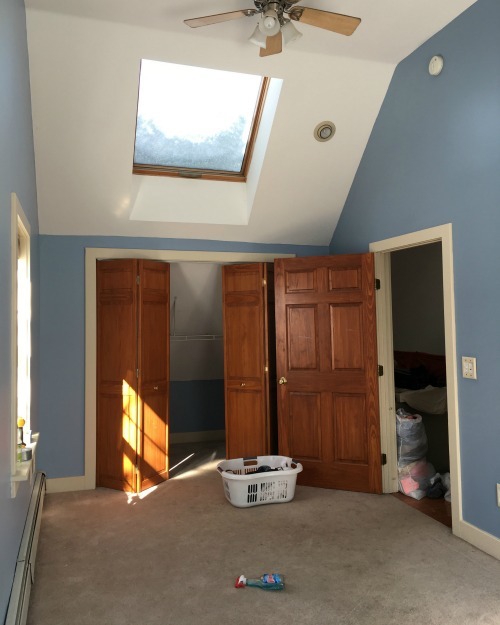 The room is light and bright and the high ceilings make it feel spacious even though it's a very narrow space. Here's a shot of the opposite side of the room after we painted the walls and trim and replaced the carpet. We also already received the Pottery Barn Elliot 3-in-1 Crib from my Mom and we love it! I plan to add the fun navy and white chevron removable wallpaper to the back wall. The colors will be light gray, navy, and army/olive green with pops of orange. We're not doing a theme, per se, but we've already picked up some fun animal-inspired pieces like the elephant knobs shown above. I already own the IKEA hemnes dresser (shown above). I bought it in black and painted it white when I decided to use it in the guest room at my old house. I want to paint it an army green color for Baby K's nursery and swap out the knobs. 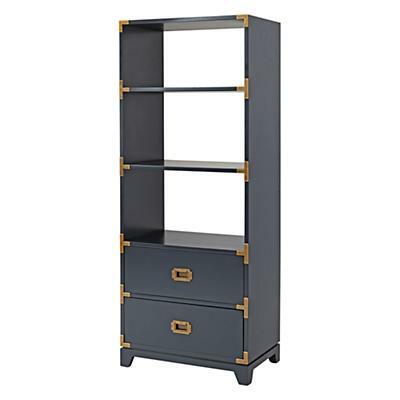 I am IN LOVE with the Land of Nod Campaign Bookcase in navy, but it's a splurge and I'm not ready to commit. I want to get some other pieces in the room first before I make my final decision. One of the DIY projects we're most excited about working on are these fun branch swings from Garden Therapy. Aren't they adorable? I'll be back with an update once I get the wallpaper up. Thanks for reading. I agree, I love what you did with this room also. Thanks for sharing the ideas and the photos too!